Audio-Technica’s flagship, open-back professional reference headphones feature specially designed drivers and acoustically transparent housings fashioned from aluminum honeycomb mesh. Large, proprietary 45 mm drivers are tuned to faithfully reproduce extreme low-end frequencies down to 5Hz, as well as highs up to 40kHz—all while maintaining perfect balance. The ATH-R70x headphones provide an accurate and natural closed-back sound, and are ideal for studio mixing and tracking, FOH, mastering, post-production, audio forensics and personal listening. 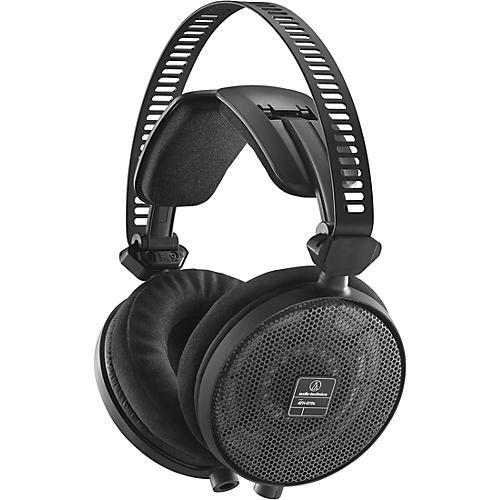 Thanks to ear cups that swivel 90°, these robust headphones are also perfectly suited for professional DJing. While mixing in loud club environments, professional DJs will also appreciate the excellent sound isolation provided by the around-the-ear design. The ATH-R70x professional headphones incorporate an improved design of Audio-Technica’s 3D wing support system to provide even greater comfort during prolonged use. Robust yet lightweight, and equipped with a unique, dual-sided detachable cable that automatically maintains proper stereo orientation (no matter how it’s attached), the R70x headphones are built for lasting comfort, convenience and audio purity.